When you wear your favorite pair of shoes for an extended amount of time, you will eventually need to repair them. One of the most common issues is for your shoe to break away or crack at the sole, and this can occur even if you care for them. Instead of throwing out your shoes or spending a lot of money getting them repaired by an expert, you can try to do the job yourself. Most of the shoe-repair stores will use glue to fix cracked heels and soles or tears within the upper shoe and you can do the same thing at home. Here's what to look for in the best glue for shoes and how to glue broken shoes. 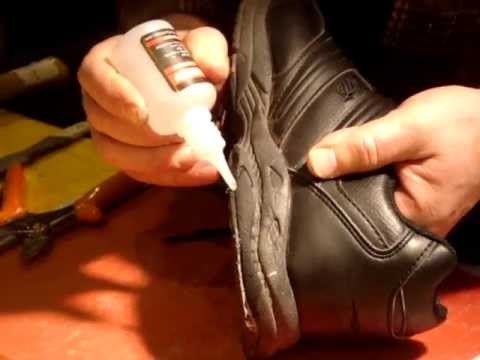 There are several types of glue that you can find to help you repair your shoes and it helps to understand what they are. This rubber is made into adhesives that are part of shoe repair in addition to sealants and molds. You can apply it onto a sole that is damaged or separated. This material will resist heat and prevent water from getting into your shoe, which can be an uncomfortable experience. Best of all, glue made from urethane rubber won’t stiffen your shoe after it dries so the shoe will still maintain its flexibility. Neoprene-cement glue can be used for many different materials, including thermal plastic polyurethane, paper, plywood, wood, polyurethane, thermal plastic rubber, rubber, crepe, and leather. The main advantage of neoprene cement glues for shoes is that it works on a wide range of materials, including all of those most commonly found in shoes. It is a common choice for shoe repair due to its versatility, strength, anti-corrosion within the gluing surface, and quick drying time. Although it is ideal for repairing rubber shoe soles, you can also use it on the other materials of your shoe. This is a popular choice due to its ability to bond permanently in a short amount of time. It is easy to find in almost any craft or hardware store, dries quickly, and can seal leaks within your shoe soles. You should always wear a pair of gloves if using super glue because it may affect your skin due to its quick-binding properties. This is typically used for repairing shoes or metal and in craft projects. Although it has a strong-hold, you need to be careful when using it on shoes. If the epoxy has large quantities of its catalyst (within the resin formula), it will dry quickly, but may crack in cold weather or eventually. Although formulas with less catalyst take more time to dry, they are more stable. Always select slow drying (around 24 hours) epoxy glue for shoe repair. One of the best glues for shoes is Shoe Goo, a glue designed specifically for repairing various portions of shoes. It works on all major materials, allowing you to use it on any portion of your broken shoe, including the sole, leather top, or canvas. When it dries, you will end up with a flexible rubber that is also waterproof. This particular glue for shoes is very durable as well as easy to apply, making it an ideal option. It is also affordable at just a few dollars (about $6 to $8) for a small tube, which is typically all you need to for minor shoe repairs. Shoe Goo is truly versatile enough to work for repairing most types of issues with your shoes including worn outer soles and damaged heels. You can also use it to seal rubber boots and waders or a coating to protect shoes or add extra traction on a skateboard. It is actually strong enough to use on sports shoes and runners use it frequently to patch up a pair of their favorite sneakers to extend their life. Gorilla Glue is in the same price range as Shoe Goo and is just as easy to find. The main difference, however, is that while Shoe Goo was designed specifically to repair shoes and is marketed as such, Gorilla Glue is designed to bond and seal all types of materials, including shoes. That means that in addition to fixing any portion of your shoe (including the rubber, canvas, leather, and laces), it can also bond wood, metal, stone, ceramics, glass, concrete, and foam. It is also resistant to temperature and waterproof so you don’t have to worry about using the product to repair your shoes only to have it dissolve when you go outside in the rain. Because of the type of substance Gorilla Glue is, it expands and then strengthens and this means that you need to be careful when using it to prevent spills or drips. After learning the best glue for shoes, the next step is to glue your shoes properly. Before you start gluing your broken shoes, make sure that they are dirt-free, clean, and dry. Try to roughen the surface and keep the glue between 70 and 80 degrees Fahrenheit. Start off with a small area of your shoes to ensure you understand how to apply the glue and how long it will take to dry. Keep in mind that exposing the glue to warm water for long periods of time can lead to discoloration or reduce the adhesive properties, which can also occur if you expose the shoes (and glue) to chemicals like those in the pool or hot tubs. (Notes: this applies for Shoegoo; instruction for other glue may vary; please read the label for the shoe glue you use before applying). Glue will harden via evaporation of the solvent, creating an instantaneous bond so after you apply pressure on the two surfaces, it will be hard to separate them. Always give your glue a full 24 hours to dry as the drying time will vary by material and the amount used. It takes longer in lower temperatures as well so it may take 72 hours to reach maximum strength. Be sure that you keep glue off the top of the tube and put a bit of petroleum jelly on the top of the tube underneath the cap so it is easy to remove. You can clean up uncured adhesive using small quantities of paint thinner or acetone and it will ball up so you can brush it off. You can scrape or cut off cured material. Server responsed at: 04/18/2019 3:14 p.m.